This film is a remake of Robert Weiner’s 1920 classic film of the same name. When I first saw this available on netflix instant viewing a light went off way in the back recesses of my mind. It occurred to me that I had read about this in one of my many film mags, but had filed it and forgot about it I remember being real excited about it, so when I saw it available I watched it then and there. From the opening scene I was hooked it was almost identical frame by frame shot of the original. I knew this was going to be a modern black and white marvel. The first thing that I noticed was the make-up the dark rings around the eyes, the pale gray faces, the black lipstick on the lips, this was authentic pancake makeup applied in the silent movie tradition. If it wasn’t for the fact that there was actually sound (voices) I would of swore it was a silent. The scenery was astoundingly similar. In the original the scenery was surrealistic ,it sort of looked like Salvador Dali, and Picasso worked hand in hand with a couple of 5yr olds. In the remake it was duplicated exact, the surrealism was hauntingly beautiful, the buildings, doorways, and windows were built at such extreme angles unsettlingly, yet the furniture in the houses and buildings were normal adding a reality contrast to the surrealistic feeling. What a lot of people don’t know is that at the beginning of film making the Germans ruled the large screen. 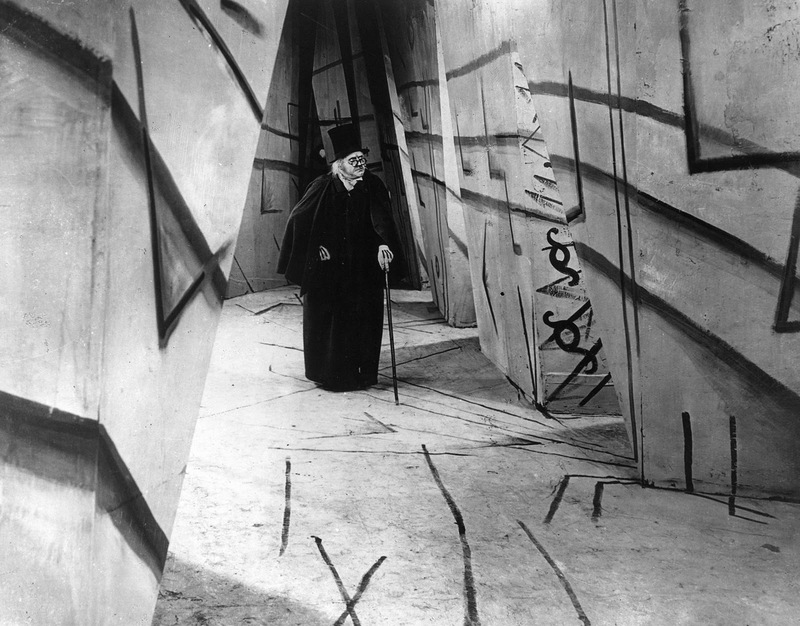 the germans were responsible for such silent classics as Metropolis, The Golem, and Nosferatu, just to mention a few, also they brought to the film world some of the most talented Directors and film makers of their time, names like Robert Weine, Paul Wegener, Fritz Lang, F.W. Murnau to name a few. So David Lee Fisher had some big shoes to fill and to me he filled them just fine. David Lee was not only the director also wrote this remake with the help of Hans Janowitz and Carl Mayer. They had to pad the storyline a bit to fill in their rendition of what might have been said in the original, and I think to put a bit more meat on the original bone. The acting in this movie was as exaggerated and over the top, as the original silents ( with no voice sound they had to portray themselves and the story with emotion and body language back in the silent film era). All the actors did a fine job with this over the top acting. Daamen Krell’s Calagari was almost the twin of Werner Krauss’s, Judson Pearce Morgan who played Francis Geist, and Neil Hopkins who played Alan, Francis’ best friend and competitor for the love interest, Jane Stern, played by the lovely and alluring Lauren Birkell, all seemed to have fun running around the claustrophobic sets all looking like graduates from the Vincent Price school of acting in their 1920’s costumes. 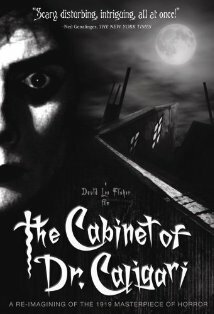 Now I come to my Favorite in the movie Doug Jones who played Cesare the Somnambulist, and although a little more animated and a little thinner build he was every bit the Cesare, that Conrad Veidt was. Stiff robotic movements, the skin tight black bodysuit and the bleach white face of someone who has slept for the last 20 yrs, never going out in the sun. This will in no way at all be a spoiler (I try not to do that when I review) there is a twist at the end of this movie. Now think about this the original 1920s film had a twist ending in it that as far as I’m concerned has set the bar for twist endings in movies for the next 88 years to come. ( I told you the German filmmakers were leaps and bounds). If you are interested in watching this remake I suggest you start with the original and then the remake watch them back to back I don’t think you will be disappointed. Both are a hauntingly cinematic treat. -Photo(s) used are property of Image Entertainment and Goldwyn Distributing Company. They do not belong to GeekTheWorldOnline and are intended for use in character and media review in strictly entertainment and editorial means.